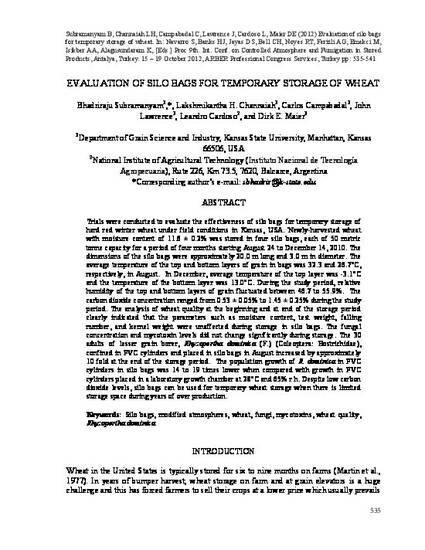 Trials were conducted to evaluate the effectiveness of silo bags for temporary storage of hard red winter wheat under field conditions in Kansas, USA. Newly-harvested wheat with moisture content of 11.6 ± 0.2% was stored in four silo bags, each of 50 metric tonne capacity for a period of four months starting August 24 to December 14, 2010. The dimensions of the silo bags were approximately 20.0 m long and 3.0 m in diameter. The average temperature of the top and bottom layers of grain in bags was 32.3 and 26.7°C, respectively, in August. In December, average temperature of the top layer was -3.1°C and the temperature of the bottom layer was 13.0°C. During the study period, relative humidity of the top and bottom layers of grain fluctuated between 46.7 to 55.9%. The carbon dioxide concentration ranged from 0.53 ± 0.05% to 1.45 ± 0.25% during the study period. The analysis of wheat quality at the beginning and at end of the storage period clearly indicated that the parameters such as moisture content, test weight, falling number, and kernel weight were unaffected during storage in silo bags. The fungal concentration and mycotoxin levels did not change significantly during storage. The 30 adults of lesser grain borer, Rhyzopertha dominica (F.) (Coleoptera: Bostrichidae), confined in PVC cylinders and placed in silo bags in August increased by approximately 10 fold at the end of the storage period. The population growth of R. dominica in PVC cylinders in silo bags was 14 to 19 times lower when compared with growth in PVC cylinders placed in a laboratory growth chamber at 28°C and 65% r.h. Despite low carbon dioxide levels, silo bags can be used for temporary wheat storage when there is limited storage space during years of over production.